Nath’s Spine was once a shrine that sat along a major road. A reminder of Draenor’s ancient past. It was here that the warlord of the giants, Nath, fell during the Gigantomachy, the war between the Breakers and Primals. Over time, it was mostly abandoned, but a select few remained to respect their heritage. Despite Nath being a symbol of war, those with enough reverence to take the pilgrimage to his shrine tended to lack the ambition of the rest of the empire, and were somewhat seen as outcasts, but none could foresee what was to happen after the Dark Portal opened. Draenor was destroyed, and the shrine to Nath was one of the last pieces of the empire to survive. When Draenor was broken, Nath’s Spine was in turn broken. The servants of Nath believed they were bearing witness to the end of the universe, and many were lost in that tumultuous time. The remaining gronn sought to take advantage of the chaos, but just as the ogres were about to lose hope, the great cavern split and Nath emerged, reborn. Nath carved a bloody path through the gronn and the ogres found new resolve as their god returned. When Nath settled back into his ancient throne, however, the ogres realized something was wrong. His face was split and one half was slumbering. It wasn’t long before they realized he did not destroy the gronn for their benefit, and the servants of Nath found themselves preparing defenses against their god as well as their foes. It wasn’t much longer before the alien sky above them became another source of fear. Dark beings from the Nether made a fiery entrance on Nath’s Spine, and immediately began to assault the ogres. Their dark magic and evil rituals were anathema to the servants of Nath as well as the gronn, and the two began to lose interest in each other as they formed bulwarks against the Burning Legion. The player will begin this zone as a relatively young ogre, going through their rites of passage. Initially, they will prove their strength in a number of challenges, before revealing their cunning as well. The rites are eventually interrupted by a Legion attack, which the player helps fight off. Afterward, the leaders instruct you to gather an offering for Nath, in hopes that he will finally regain his mind and assist them against the Legion. Nath smashes the offering instead and begins to go on a rampage. The ogres scramble together a plan to drug Nath to get him lethargic and apathetic once more. When Nath is finally subdued, the ogres decide they finally must do something about Nath if they hope to ever survive. You are sent off to an oracle at the fringes of Nath’s Spine, who is revealed to be an ogre from Ogri’la, who arrived on a Nether Ray. Once the ogre has the necessary components to cast his clairvoyance spell, it is revealed that part of Nath is still trapped in a dark orb in the great cavern he was imprisoned in, but the orb is locked behind a gargantuan boulder too large for even the greatest ogre to budge. Upon hearing this news, the leader of the ogres reluctantly admits that there is only one option… recruiting the assistance of the gronn. The first audience with the gronn fails miserably, but the ogres know it’s their only chance. The gronn only accept a challenge of strength and you are chosen for the role. Using the skills you had learned through leveling so far, you must defeat a council of gronn, most of which you have to use your cunning to get around their much greater strength. The leader of the gronn reluctantly submits once you finally defeat him, and he agrees to help move the boulder in the great cave. The orb is guarded by one of the Nathrezim, who it is revealed arrived on Nath’s Spine to turn one of Sargeras’ greatest regrets into one of his greatest allies. Once he is defeated, the orb is brought before Nath, where it is finally broken. His other half finally awakens and Nath stands, whole once more. He questions the dark haze he has been under and apologizes for abandoning his people. His resuscitation happens at an advantageous, though not coincidental, moment, as the Legion assaults once more. This time, however, they have constructed a portal that is bursting forth with demons of immense power. The player helps secure the ogre city before pushing out and clearing the way of Legion. A great demon emerges from the portal, however, and mortally injures the ogre leader. At that very moment Nath arrives and duels the demon in an epic battle. After a titanic struggle, the demon is defeated and crushed beneath Nath’s feet. With the player’s help, the portal is destabilized and Nath prepares to smash it. The dying leader stops him, however, and appeals to his other half. The leader proposes that they instead use the portal to escape their isolated island. Nath fully realizes his full nature and agrees. The ogre magi work to redirect the energy of the portal while Nath thanks the ogres for watching over him, but remarking that he left some very important business unfinished millennia ago and proclaims that he must leave them. The ogres bid Nath farewell and, with their ancient charge finally fulfilled, they consider reconnecting with their scattered brethren. It is at this point that the player is given the choice to use the portal to accept the shattered Stonemaul Clan or the collapsing Boulderfist Clan. Young one, today you will begin the rite of passage until adulthood… assuming you pass the first test. You’ve fought on these cliffs many times before, but now is the time your elders will truly be watching. Return to the Teeth-Cutter’s Ridge one last time, and prove yourself a true son of Nath. Defeat 3 ogres in boulder smashing and 3 ogres in boulder throwing. Now for the oldest and most famous test for our people. Head down into the Circle of Power and be ready to compete with your peers. Challenge the ogres you find there to either boulder smashing or boulder throwing contests. Prove your strength by being the first to obliterate your boulder or by throwing it the furthest. Return when you have proven yourself three times in each contest. Defeat the gronn in the strength contest. This is the final test before you will be known as a true ogre. We have wrangled one of the gronn into the Circle of Power. He will not be happy, and he has a very, very large boulder to win the fight with. If you think you can defeat him with your boulder, enter the ring. After that attack, I’m not so sure we can last much longer. We need Nath’s assistance. Now that you are an adult, there are new responsibilities you have. With the other warriors busy fighting those demons, this task is now yours. Gather the mushrooms that float over to our island and bring them to the cook so we can prepare an offering to Nath to convince him to help us. Nath is razing our land! The devastation the gronn and the demons have caused up until now is nothing compared to this, even our Bone Crushers aren’t enough to stop him. I have a plan though, and it’s going to require you to poke around our smashed mounds for a few things while everyone else keeps Nath busy. We have some drinks left over from our last feast stored around the town. Collect these and return them to me. It’s powerful stuff, so watch out. It could sedate a herd of clefthoofs. Nath is on too much of a rampage to care about ale at the moment, all he wants is blood. Search the rocks on the hills east of town for a certain red moss that grows there. Don’t worry, it’s all part of my plan. Trick Nath into drinking the ale. I mixed the red moss into the ale to make it resemble the blood Nath is so desperately searching for right now. Spread it around the hills just outside town to trick him into drinking it. Hopefully when he does it will work its magic and put him down for now. We can figure out what to do about him once he’s out cold. Nath’s Spine is a new floating island off the southwestern “coast” of Outland. 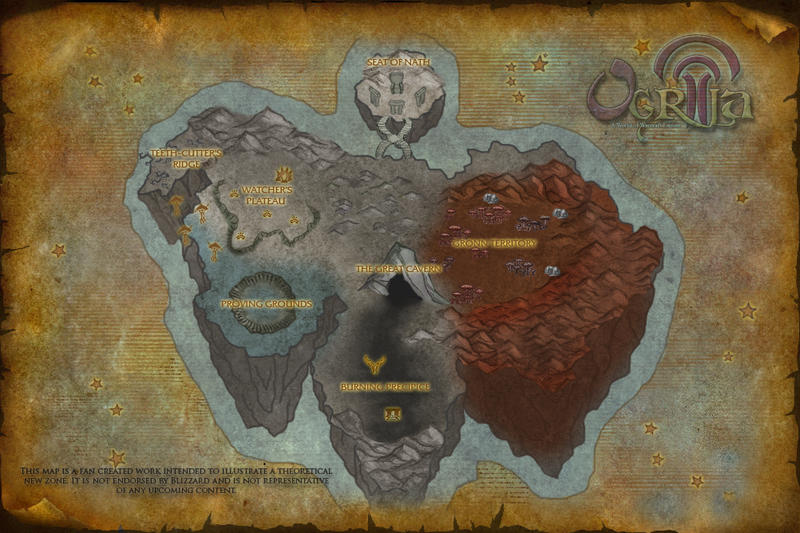 Flight paths may be found to reach the island at a later point, but characters who start there will leave through a portal, since they will not return to Outland until they’re level 58. The zone will have four main appearances. The first will be the harsh, rocky mountains of the ogre’s land. This gray land will be designed to reflect the strength of the ogres that make their living in the rocks. In the east is the land of the gronn. This reddish land will have forests and many high vantage points, to reflect how the gronn stand tall over the other races and seek to control them. The southern section of the zone will be twisted and broken, showing not just the Legion’s affects on the land, but the aftermath of the mountain splitting in two. Finally, the Seat of Nath in the north will much resemble the ogre’s land, but in a brighter, more statuesque color and design. Player’s start on the Watcher’s Plateau, a town composed of a new type of ogre mound, more refined and resembling more permanent dwellings. A path leads up and to the west of the town, known as Teeth-Cutter’s Ridge. The ridge is filled with rock flayers, and thorny brambles resembling obsidian. Below the plateau are the Proving Grounds, a recessed section of the mountains carved out by centuries of fighting between fledgling ogres. It is divided into several subsections where individual fights can go on uninterrupted, as well as a large ring in the center for special fights. Just to the north of the Proving Grounds and next to the plateau is a small strip of land overhanging the Twisting Nether, where a special species of mushroom floats over from the wreckage of Draenor, based on floating mushrooms from early depictions of Outland. In the center of the zone is a large mountain now known as the Great Cavern. Inside is a vast open cavern with mysterious murals on the walls and a giant boulder blocking a seemingly man-made altar. When the destruction of Draenor cracked the mountain in two, it also upset the land above and below it. To the north is now an expanse of rolling hills, resulting from the tectonic disruption. The south, on the other hand, was left as a large series of cracks that crisscross the land, leaving behind a broken wasteland that is luckily still relatively flat. At the edge of these cracks is a portal that dates back to the Second War. The area is now known as the Burning Precipice, due to the arrival and fortification of Burning Legion forces in the area. The Legion has added craters to the cracked wasteland thanks to the arrival of Infernals. The eastern half of Nath’s Spine is simply known as Gronn Territory to the ogres. It is an almost tropical area, with large paths carved out between the mushroom trees by the gronn who live there. Most of the time, however, the gronn stay in their gargantuan caves along high mountain paths. The zone gets its name, however, from Nath himself, who resides in the north. Connected, just barely since the destruction of Draenor, to the rolling hills, is the Stair of Ascension. It is a great marble staircase rising from carved stone to reach the Seat of Nath. The Seat of Nath itself is a great marble chair rising from a carved circle, surrounded by marble posts and lintels on three sides and framed by a sheer mountain on the fourth. This was my attempt at creating a racial icon like those Samwise Didier has made for all of the playable races in Warcraft III and World of Warcraft. The central object is a simple shield inspired by the gut plates seen on heavily armored ogres in World of Warcraft. Upon it, I painted an eye symbol that appears on the tiger hide banners sometimes seen in Ogre Mounds. I don’t know the real symbolism of it, but I thought the ogres would need a symbol that could fit a variety of origins, unlike the very specific Ogri’la symbol used on this site. Starting at the top and going clockwise, you first see a horn protruding from the top of the shield. I drew this to resemble an ogre lord’s horn in order to represent the bridge between the ogres and the gronn, who they show a clear relation to. Also, it makes the shield into a potentially threatening weapon as well, which a warrior race like the ogres probably would like. Next is a massive wooden club reinforced with great iron bands. This weapon was inspired by one that Samwise drew an ogre holding, and I think it’s a perfect companion to the axes on the orcish racial shield or the wrenches on the gnome one. These clubs also feature bloodstained cloths wrapped around their handles, to give the ogres better grip and to show the fate of their enemies. Emerging from the sides are spiked, wooden palisades. This is to show that while the ogres are currently a simple people, they are just as dangerous and threatening as any other. Coupled with this are the spiked balls on chains attached to the palisades. Inspired by the massive earring worn by the Ogre Lords in their concept art, I thought it again showed that ogres have more than enough potential to be menacing and powerful, and not just walking jokes. Finally, at the bottom of the shield is the skull of a black dragon. This enemy seems to be running its course in Cataclysm, but black dragons are the direct enemies of various ogre tribes throughout both Azeroth and Outland, and it seemed appropriate for an ogre to carry around such a trophy. I hope you like it, considering this was my first attempt at doing something like this, and it was quite a challenge trying to echo Samwise’s designs. I know there are some things off with it, including the clubs not quite lining up, the shading being a little flat, and the metal doesn’t quite fit in with the rest of the style (though I think it came out pretty well for being my first attempt at coloring metal). To create Nath, I looked to mythology. I drew from many different war gods and fables surrounding them. Many mythological characters have a variety of natures, and it is this that is Nath’s main draw. Pieces of lore suggest that the ogres are more clever than they let on, and the two-headed ogres and the magi show a powerful heritage. I took those suggestions and created an origin for them: A creator with a dual nature. Nath went through several designs. The first was rocky, based off the simple idea that he was an earth giant, creatures said to have once existed on Draenor, but with little lore available. The second took a different approach, imagining Nath as more of a viking warrior, but it just wasn’t turning out for me. The design you see here is a mix of both. I took the basic idea of the ogres and their features, but gave them a build of a godlike hero. The bony protrusions and tattoos reflect Nath’s connection to the gronn as well. Nath’s outfit is designed to make him appear as a strong warrior, made even more menacing by his extra pair of arms. 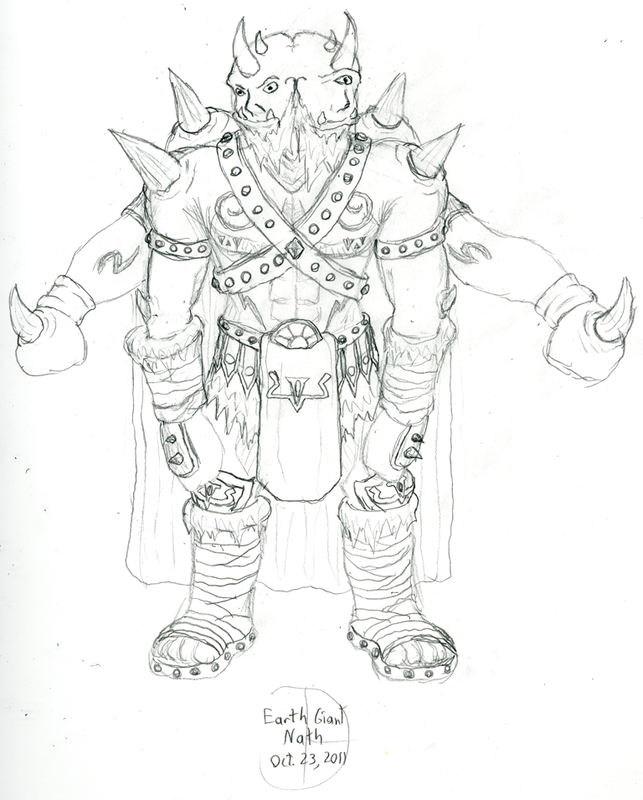 From there, I simply added a few more details to tie everything together, such as a dual-faced head that echoes the ogres but is not fully split, and symbols on his loin cloth and knee pads to suggest a possible connection to the Titans. Vanir does mean earth giant, after all.